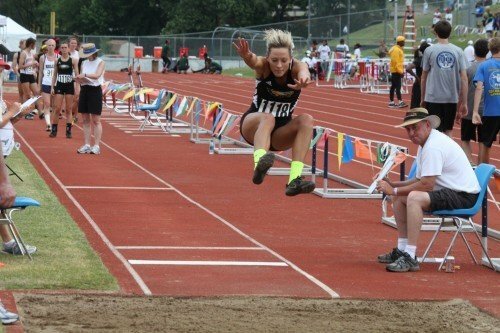 Sullivan's Macy Ritter competes at the MSHSAA Class 3 track and field championships, where she won four state medals, including a first-place finish in the long jump with a leap of 18-0. 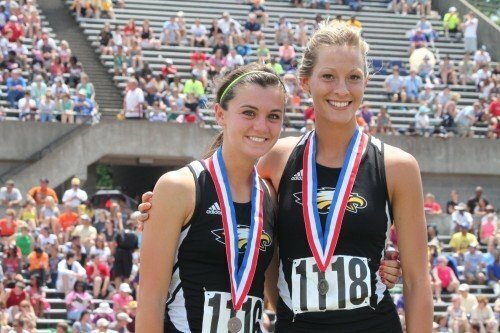 Sullivan's Bria Bartolotta, left, and Macy Ritter both won four all-state medals at the state track and field meet, leading the Lady Eagles to a third-place finish in Class 3. The Sullivan Lady Eagles finished third in the Class 3 team standings at the MSHSAA track and field championships at Lincoln University in Jefferson City. It could not have been much better of a weekend for Sullivan senior Macy Ritter. Competing in the MSHSAA Class 3 track and field championships last Friday and Saturday at Lincoln University in Jefferson City, Ritter captured all-state honors in four events, including the state title in the long jump. The top eight finishers in each event earned state medals. Ritter won the long jump with a leap of 18-0 and finished fourth in the triple jump with an effort of 35-3 1/2. She’s the first female athlete to win a state track and field title at Sullivan High School. The 400-meter relay team of Ritter, Bria Bartolotta, Brianna Winistoerfer and Natasha Snavely placed sixth in a time of 49.91. The 800-meter relay team of Ritter, Bartolotta, Winistoerfer and Natalie Schriever was sixth in 1:45.97. Ritter’s performance helped the Lady Eagles win a state trophy for a third-place finish in Class 3. Ritter won the long jump title in dramatic fashion on Friday. Entering her last jump of the finals, Ritter stood in second place with an effort of 17-0. Kayla McGee of Lincoln College Prep was in first place at 17-10. Needing to beat 17-10 for the state title, Ritter exploded for a distance of 18-0, a full foot better than her previous best mark of the day. Sullivan Coach Pat Burke said Ritter came through in the clutch. Considering that Ritter’s personal best in the long jump is 18-4, she knew she could beat 17-10. Bartolotta also won all-state medals in the same four events Ritter did. So how exactly did Bartolotta pump Ritter up for her final jump? Ritter came back on Saturday and finished fourth in the triple jump with a best effort of 35-3 1/2. Ritter made big strides in the triple jump in a short period of time. “We switched Macy over to the triple before the conference meet and she has been getting stronger and stronger,” Burke said. “Macy had a monster jump on her second finals jump. It would have easily won the meet, but she barely scratched on the board. It was huge, definitely her best jump of the season. Ritter and her sprint relay teammates competed in the preliminaries on Friday and the finals on Saturday, notching sixth-place finishes in both the 400- and 800-meter relays. It was a banner weekend for Ritter and Bartolotta. Ritter leads a senior class at Sullivan that enjoyed tremendous success in track and field. Ritter said she will continue her track and field career probably at either Southeast Missouri State University or the University of Missouri-Kansas City.